The intersections between Special Interest Sections offer opportunities to expand our horizons and build on each other’s knowledge. The following member spotlight is written by Eve Ross, a member of Professional Engagement, Growth & Advancement Special Interest Section (PEGA-SIS), and focuses on Jordan Jefferson, a member of both CS-SIS and PEGA-SIS. Jordan Jefferson is the Coordinating Librarian for Research Services and Lecturer in Legal Research at the Yale Law School. To Jordan, PEGA means opportunity. When she was a newer member of AALL, PEGA-SIS was the main lens through which she learned about AALL as an organization. Her goal in continuing as a leader in PEGA-SIS is to give today’s newer members ongoing opportunities to lead, create, and learn. She also reminds herself to pause and learn from today’s newer members because they have so much to offer. PEGA-SIS’ strength is its transparency; as an SIS, it champions openness, honesty, and even vulnerability. As PEGA-SIS’ current newsletter editor, Jordan supports these SIS goals by including discussions of emotional labor in the library and how to have difficult conversations. Jordan is a member of CS-SIS because she is “obsessed with technology” (her words). She loves the idea of technology and revels in the thought of how different her job would have been 50 years ago—or even 15 years—and how different it will be 15 or 50 years in the future, mostly because of changing technology. CS-SIS helps Jordan take an aspirational vision of “libraries of the future” and turn it into boots-on-the-ground conversations around specific issues others have encountered with AI or with SQL, for example. Jordan benefits from the fact that someone in CS-SIS has probably already run into any technology question she is likely to have, and fellow CS-SIS members are generously willing to offer their insight. 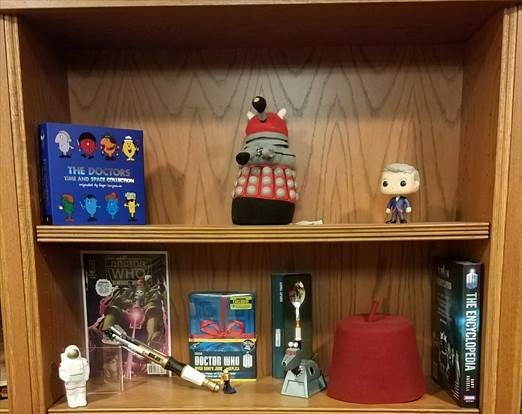 In the words of her Twitter bio (@jordanajeff), Jordan is a “law librarian, wife, mother, baker, [and] amateur time lord.” Her amateur time-lordship may have something to do with the fandom shelves she maintains in her office, one of which is pictured below. 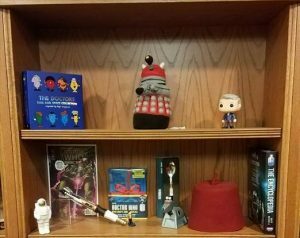 Jordan plans to take a 10-week Python course via Lynda.com this summer, and she recommends the book All Our Wrong Todays by Elan Mastai as a geeky summer read.